Silos exist across organizations everywhere, between Marketing & IT, Human Resources, Customer Service and Sales. 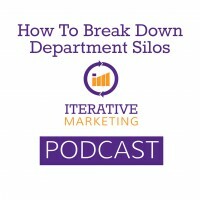 Breaking down silos between Marketing and Sales increases collaboration, reduces duplicated effort, leverages expertise and creates consistency. To break down silos, departments must change how they operate, with endorsement from the top of the org chart. There are many opportunities to collaborate across Marketing and Sales, specifically: personas, customer journey mapping, brand development, content creation, experimentation and feedback on lead generation. Learn six tips for successfully integrating Marketing & Sales.